The main thing that concerns me about today’s Slylock is what’s going to happen to that poor li’l baby ape once Harry and his mom get hauled away in handcuffs thanks to some extremely circumstantial evidence and Slylock’s ratiocination. Does animal society have some equivalent of the human foster care system? Or is he just going to be returned to the forest to fend for himself? 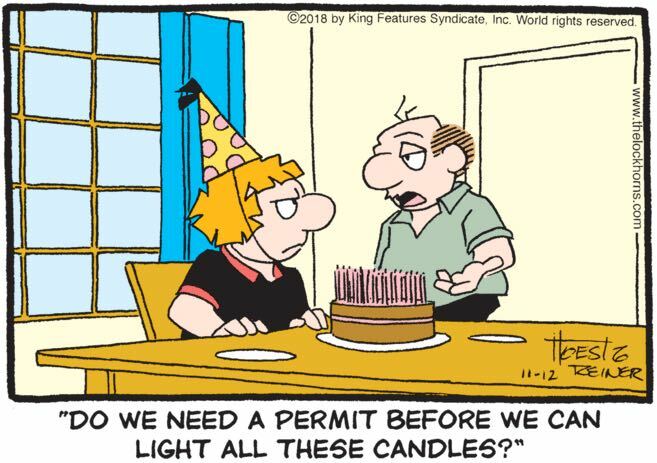 It is, of course, entirely believable that the Lockhorns, having alienated all their friends with their palpable mutual loathing, would end up having a tiny birthday party, just the two of them, for Loretta. But I will never get over the fact that the birthday girl, in a desperate attempt to try to inject a certain sense of fun into this deeply grim occasion, has put on a whimsical party hat, and Leroy stubbornly refused to get on board. He won’t even give her this.